Whelp, guys and gals, it’s happened. The official Deus Ex twitter profile announced today: “You asked for this: we are cancelling the “Augment Your Pre-Order” program. Read all the details here – https://www.deusex.com/news/aypo-cancelled“. If you’re not familiar with the program, it was a somewhat gross system where you choose which pre-order bonus you’ll receive, with more pre-orders unlocking more options, with the last “bonus” being that the game would be releasing four days early. I write about it here. While people are frustrated when games offer different pre-order incentives at different outlets and regions, it’s not the inconvenience of having to find a copy of the game at an outlet you don’t use that’s the cause of the frustration, rather the fact that it feels less you have a complete product when pieces of the game have been cut out and scattered to the four winds. 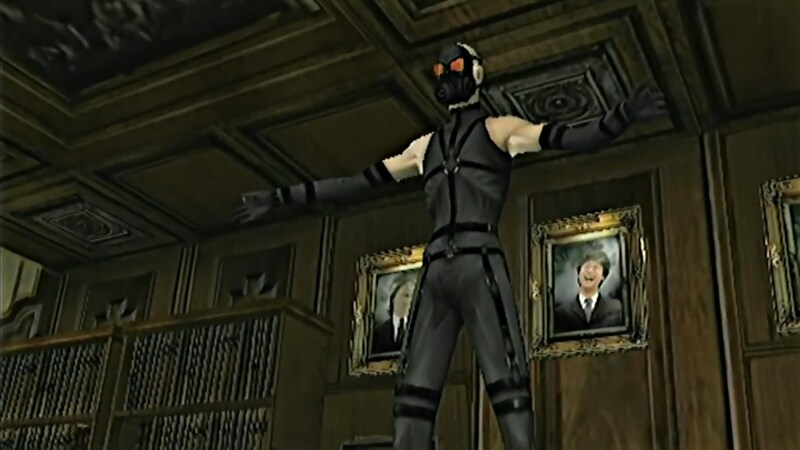 While Square Enix and Eidos Montreal seem to be making the right move in terminating the program, their attempt to cover themselves feels kind of disingenuous. It is nice to see the companies owning up to their mistake and going back on their gross program. Sure, it seems like this move is motivated by PR rather than customer service, and pre-order bonuses are a bit of an icky concept anyway, at least it’s a step in the right direction for now. 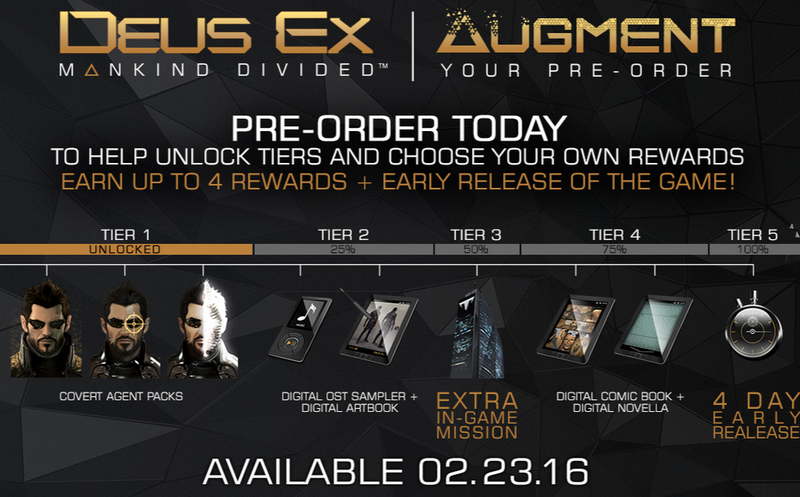 For those of you that’re out of the loop, Square Enix have announced their preorder incentive for Deus Ex: Mankind Divided. It’s called “Augment Your Preorder”, and it’s kind of like the Kickstarter stretch goals system in that the more people that preorder the game, the more preorder bonuses there are to choose from, the last goal being that the game releases 4 days early. When are companies going to understand that divvying up content so that no (sane) person can have a fully complete version of a product, really pisses everyone off? It’s a terrible practice on a PR and customer relations level, and it just leads to degradation of the art form. The target number of preorders for the five (!) tiers of goals are secret, which probably means that no matter how many people fall for this rubbish, Square Enix gets to come out with a press release claiming that all of the tiers have been reached, and, yes, they’re very proud of how the community has already rallied around the game. I can just picture the smug release now. Now, there’s been a fair amount of outcry, although I’m not sure how much outrage will actually lead to a change in this kind of practice. We’ve been putting up with this blatant disregard for customers and games as an art form for years now; as anyone who remembers the absolute clustermolest that was the list of Watch Dogs editions and pre-order incentives. Pre-order incentives in general tend to lead to a system of haves and have-nots, and you really don’t want a customer paying for a full-price triple-A game feeling like a have-not. Now, I’m not totally against pre-ordering like many people are. For instance, I myself pre-ordered the Pip-Boy edition of Fallout 4, because that is a very exclusive product that I’d probably have to resort selling my organs for had I relied on eBay scalpers down the line. But, in this case, the blatant disrespect for the consumer is such that I just cannot condone pre-ordering this game. And that makes me sad, because I love Deus Ex, and the developers probably had little to no say in Augment Your Preorder program.